Academy for Performing Arts Drama Theatre (December 15th 2009) & HK Cultural Centre Studio Theatre (December 21st 2009) in aid of Youth OutReach and Dog Rescue. 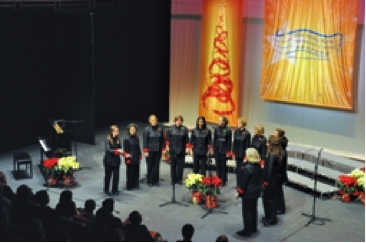 At the ‘Christmas in the City’ concerts, we sang over 20 songs. Genres included traditional ones like Angels Carols and Tomorrow Shall Be My Dancing Day, gospel songs like Oh Happy Day, festive songs like White Christmas and so on. On December 15th at the APA (Academy for Performing Arts), we also partnered with the KGV School senior choir and orchestra, bringing more variety to the concert. The Christmas concerts raised funds for two charities in Hong Kong: Youth OutReach and Dog Rescue. At the concerts, these charities were also able to set up promotion counters to publicize their work. On November 30th, we were invited to sing with a soprano from Germany in a concert at St John’s Cathedral organized by Karen Kids. We were also joined by the primary school choir from the German Swiss International School.